In horror campaigns, any book with a name is guaranteed to be dangerous beyond imagining, but aren't you just the least bit tempted to see what lies between the covers? Power beyond imagining? Terror beyond comprehension? Look inside this product and discover four fell tomes steeped in malevolent magical malignancy, including new simplified sanity rules, connecting magic and monsters alike to Lovecraftian alien mythos, four new metamagic feats, and 20 spells, 12 original creations and 8 familiar spells corrupted into something wholly and awfully other. Designed by Jason Nelson and Clinton J. Boomer with the Legendary Games design team of Neil Spicer, Greg A. Vaughan, and Clark Peterson. Who better to provide you with alternate magical books, spells, and rules for your Adventure Path campaign than the very writers of those adventures themselves? Answer: no one. Legendary Games' Adventure Path Plug-Ins supplement and enrich your campaign experience, offering adventures and supporting products that incorporate and expanding upon unique concepts, themes, and rules subsystems introduced in the Adventure Paths while filling in the background characters, items, and locations that make those adventures come alive in delightful (and often dangerous) detail. Legendary Games combines stellar writing talent with innovative layout and product design and top-notch artistic values that we think will bring you back again and again. The blood-stained Sarkulis Shards, a compendium of corrupted witchery graven on the crystallized blood of familiars long dead. The Palestone Analects, a mad poet's elegy to the melding and molding of flesh and stone as one. The dusty Xanthutep Tablets, divine pharaonic inscriptions concerning the unbinding of the fundamental forces of reality. All Flesh and Form Made Ash, a smoldering divine panegyric to the glory of burning, from ignition to cremation. Download includes TWO files: a full color version AND a stripped black and white version for easy printing, both versions hyperlinked internally and to online Pathfinder resources for easy interactive reference. Check out this gothic-themed magical accessory and Make Your Game Legendary! So to start a string of reviews that don't have a title involving the word fantastic here is one of the first, Tomes of Ancient Knowledge. To start this book strives to accomplish 3 things in my mind. Number 1, to create a new and thematically appropriate system for sanity & madness mechanics for the pathfinder system, present the concept of mythos themed spells, creatures, and spellcasting in an interesting and thematically sound way, and presenting us with some thematic and compelling examples of these vile tomes. First up is the sanity system and I have to say that they hands down hit it out of the park. For those of you who like me have a passion for a certain pulp author themed high mortality horror game you've all had that fantasy at least once of being able to run some of those madness rules inside your pathfinder game. The problem I've always found though is the dissonance between the two mediums with Call of Cthulhu's sanity mechanic being very well built to help promote that horror through it's disempowerment while simultaneously being ill suited to the power fantasy that pathfinder is built to help promote. In short, the big problem with the sanity mechanic is that it's built to increase the fun by taking away a characters power which is the exact opposite of what pathfinder is built to do. Now with all that stacked against them Legendary has somehow managed to pull it off. To start the system doesn't lock itself to your wisdom stat(the classic choice for most sanity ports) but instead is built around your lowest mental stat. This does two things, one it allows players to build the character they want and not have to pump a certain stat specifically, second it manages to somehow leave no one class truly safe from the madness of the mythos. Now you get to watch as your paladin becomes more forgetful, your wizard become unhinged, and your monk slowly become more and more distant and despondent until they start shouting Tekelili! at the top of their lungs. Next even though accruing madness does bring about some penalties to your stats it also grants boons including incite into the mythos and bonuses on rolls against it. Top this off with ways to handle the penalties including temporary and permanent solution and you have what might be the best system I've seen to handle insanity to date. Next up we kind of have to talk about the tomes which make up the bulk of this book. Now I have to say that pretty much everything else in this book from after the sanity system on is pretty much GM's eyes only until your players get their hands on one of these dark and terrible tomes so if you are a player I suggest you stop reading to avoid spoiling the surprise. For the rest of you though carry on. 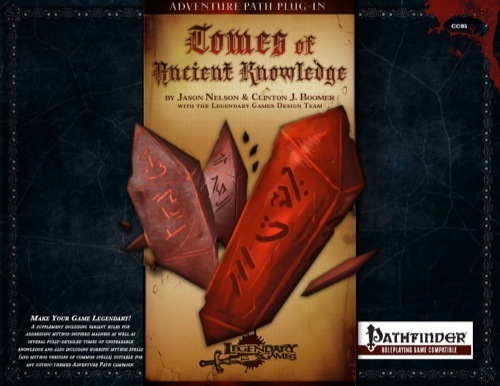 Each tome is not only well written but just oozes style with any one of the 4 tomes presented within being able to fit into nearly any game regardless of setting. From the bloody crystal shards of cannibal cults to the time warping hundred pound tablets of a Babylonian chrono cult you will find something awful to throw at your players and tempt them to play with. My personal favorites thus far are the crystal shards of Sarkulis shards, the aforementioned crystals carved with the dark teaching of a bloody druid cannibal cult and allows those who read its contents to crystallize their own blood and hurl it as a deadly weapon along or compel their enemies to try and feast on the still living flesh of their allies. The other one that really begs mentioning is the last tome of the book, All Flesh & Form by Flame Made Ash. A divine tome full of funerary rite and divine opining over the eventual heat death of the universe. Now it doesn't add any new spells in its pages but instead presents two new metamagic spells that either leave behind choking and revealing cinder clouds or mix in heavy doses of lethal radiation, forcing those who are hit by the spells to make saves or basically get cancer and begin to slowly waste away. Now this book might not be for everyone, but if you have any interest in trying to pull of a pathfinder game with cthulhian elements or that wonderful cosmic horror that games like Call of Cthulhu have then you definitely need to pick this one up, now. There is not a better book for it. Tomes of Eldritch Horror done right! The glorious return of Legendary Games is heralded by this new PDF, which covers one of the most useful yet frequently poorly done ideas in fantasy horror RPGing, the timeless tomes of forgotten lore. The PDF itself is very well done, coming in both full-color and black and white versions for printing. It is nineteen pages long, and has a title, table of contents, credits, bios of the creators, legal information, and a back page that tells you what else the company has to offer. That’s six pages altogether, and the rest is devoted to some very fine work indeed. First comes a section on sanity checks. Not as dangerous to PCs as similar ones found in other games where you can end up a hopeless gibbering lunatic the first time you see something awful, (as the writers say, heroic fantasy PCs should be a little tougher than that) but it still allows for a slow chipping away at the sanity of PCs who confront one eldritch abomination too many or who cast one too many Mythos spells. This slow fall into madness makes you easier to affect with certain spells, and harder to use some Intelligence based skills except for Mythos-related skill checks. So it gets easier to find out more about the awful truths that drive you insane as you go increasingly mad. We also get a quick definition of the Mythos descriptor for spells and monsters (basically, the classic Lovecraftian horrors) that is simple and works very well for Pathfinder. In a nice and creepy touch, we’re also told that Mythos spells can be used by non-spellcasters in a weakened form that will still drive you utterly mad. Then come the books, and they are indeed original! First up is the Sarkulis Shards, a group of inscribed large crystals once used by a barbaric cannibalistic witch cult that venerated the World Eater, a great serpent. The new spells here are based around nasty effects involving either cannibalism or snakes or both. Next are the stone Xanthutep Tablets, written in hieroglyphs and revolving around bizarre spells that allow one to warp and bend reality. Then comes the allegorical poems of the Palestone Analects with spells that can transform you in various grisly ways, some of them involving human sacrifice, And lastly is All Flesh and Form By Flame Made Ash, which has a few spells but is more original in that it teaches some new (and very nasty) metamagic feats that fire-loving mages will go crazy for. This is a wonderful addition to any campaign that uses horror elements or has characters who research the past. I was dismayed that they only have four books in here, but one can always hope for a second PDF in this series. This is wholeheartedly recommended for anyone with a love for Lovecraft in their Pathfinder. The stars are indeed right! All five of them. This supplement is 19 pages long, 1 page front cover, 1 page editorial, 1 page ToC, 1 page author bios, 1 page SRD and 1 page back cover, leaving us with 13 pages of content, so let's check this out! Legendary Games, back from the hiatus, continues to provide us with plug-in products that further enrich the APs of Paizo and to the everlasting joy of yours truly, have returned with a triple offering of further supplements for the wonderful Carrion Crown AP. After a short introduction on how to use this pdf, we are introduced to Sanity rules! Yes, sanity rules! The system herein is more geared towards providing general penalties and being tied to the books provided and thus can be considered serviceable, if not as elaborate as the one I use in my home-game - I still would love a vast system of madness and sanity with quirks, disorders etc. : Preferably at around 30 - 100 pages, but honestly, I hope legendary games expands the basic rules and eliminates the generic penalties for madness effects in the revision - the basic system is well-made and great at the scarce space devoted to it. Following these neat pieces of crunch, we are introduced to a new descriptor - the mythos-descriptor, which denotes creatures and spells associated with the dark tapestry. For those not familiar on what to expect, here's a short run down: Some regular spells also have [Mythos]-versions, which can potentially unhinge one's sanity and several creatures are also categorized as being Mythos-creatures. And then there's the introduction of Mythos rituals, which enable people who'd otherwise be unable to cast a spell or ritual to do so, but at the cost of the caster's sanity. Cool ideas that need to be expanded further. After this initial crunch, we are introduced to new tomes and here I have to inject something: I was always concerned about spellbooks and magical tomes sucking in iterations of D&D and being just collections of spells. Raging Swan Press's "So what's that spellbook like, anyways?" has addressed the problem, but this supplement takes the idea up to eleven with the first tome being the Sarkulis Shards, which are a collection of strange, red glowing crystals inscribed with nordic runes by dread witch-cannibal cults devoted to the serpent world eater. An extensive section of lore as well as 6 new witch spells are contained in this most-intriguing tome, the spells enabling a witch to create razor sharp, vampiric diamonds from their blood, call hellish ghouls, implant cannibalistic compulsions in foes, dazzle foes with weird flying serpents, entangle and crush them via madding illusions and even call servants of the dread World Eater to serve your whim. The second tome in this book is another one in an uncommon form - the Xanthutep Tablets, written in ancient hieroglyphics, were once penned (or rather chiseled) by heretics of an ancient pharaonic hierocracy (Osirion, anyone?) and include a spell that bends space to grant you a massive miss chance and get an AC-bonus, increase your reach, can dimension door with a shockwave that sends your foes to their knees, wrinkle reality to gain a luck bonus (though that one is rather petty),a shield against force effects and t5wo improved, mythos-related scrying spells as well as a variant summoning that can call Hounds of Tindalos as well as a mind-damaging true seeing. All of these spells have some kind of cool cost/danger associated with them and frankly, I'd enjoy magic in PFRPG even more if all spells were designed like this! The third tome is the Palestone Analects, a collection of disturbing and weird poems that includes a version of false life that can be improved by etching diagrams into a victim's face (!!!) and pouring acid on him/her. Faces are a topic here, and a disguise spell is twofold and shows you as a disturbing, faceless being and there's also a version that adds a rage effect. And then there are three elemental body mythos spells that also make you partially amorphous. -Atomic Spell: +1 or +2 levels, adds bubonic plague radiation sickness effects to your spells, either with onset or immediately. -Incinerating Spell: The fire-spells ignore hardness and deal 200% damage instead of 150% to vulnerable creatures. Also incinerate foes slain by the spell. +1 level. -Smoking Spell: +0 or +2 levels: Leave a fog cloud or a stinking cloud with fire area spells. Editing and formatting are top-notch, I didn't notice any glitches. Layout adheres to a horizontal, two-column standard in gorgeous full-color. Legendary Games' gothic, cool layout in full color, with blood splotches and glorious full color artworks, one for each book, is stellar and up to Paizo standards -beautiful indeed! The pdf comes fully bookmarked and the pdf also includes a full-color background-less version for ease of printing out. I'm a sucker for things Mythos-related and that's no secrets, but even if you don't like the great dark tapestry this pdf still has something to offer to you - perfect examples on why "Necronomicon" and "Von unausspechlichen Kulten" are household names and why your players don't even remember the name of the latest tome they've found: CoC tomes are characters in their own right, with quirks and dangers and significant, unique benefits to be obtained. And these tomes finally bring this sense of uniqueness and identity to PFRPG, providing an awesome example on how to make books stellar protagonists in your game. Add to that the cool concept of providing benefits beyond the normal at the cost of detrimental effects to one's body/sanity and we have spells that work very much how I'd prefer magic to be - powerful, but with an inherent risk that needs competent practitioners and still leaves the sense of danger and wonder intact. That being said, not all of the new spells herein feel perfectly balanced and honestly, while the production values are stellar, I still feel this pdf is rather on the short side. If you don't mind any of that, you will love this pdf as much as I did and if you're one of the players/DMs who enjoy flavorful spells and concepts over powergaming utility, I can definitely recommend this to you, if not, you might wish to detract a star. Personally, I love this pdf and thus, my final verdict will be 5 stars. Here it is, it wasn't up earlier when I looked. I really do not like the landscape format. I usually play out of three ring binder and to add this information to my book for reference when I am running a game is just easy. I am going to pass on all of these products even though they sound interesting because of the format. Meh been there done that. But I did buy it and the other two and plan to read it this week. My mind could use a little madness right now. It's interesting that you say that, Shem. So far, we've gotten a lot of positive feedback on the landscaped format. It makes viewing these files on a tablet or laptop PC much easier as we can take advantage of all the elements that PDFs offer. And, since this is ultimately an electronic product, it seemed like that would maximize its usefulness. Of course, we departed from this method for our pregen PC product line, because we expect GMs to print off individual characters for their players rather than giving them access to the entire PDF. As such, the printed page for a character sheet has traditionally avoided the landscape format entirely. So, we opted to as well...but only for that series. Of course, if you think the products are interesting, I'd suggest buying one and giving it a try, seeing whether it turns out to be as inconvenient as you expect when you're using it. You never know, you love it enough to overcome your initial reservations. If not, we hope you'll keep looking at our products in the future and see if one blows your mind enough to give us a try. And they shall say - He Died as he Lived! Woohoo! It's finally here! I am so very happy to see new work from these folks. I bought the first product you published and liked the product. Printed it out and after a while just threw it away because I was never going to use it in the landscape format. Having it both would be awesome and I would buy everything you do. Clark's name (and others) goes a long way with me. I only buy from three companies currently. You would be the fourth if I could get them in portrait. I personally prefer the portrait, and love that you guys went in this direction. It definitely makes it much easier on electronic devices than the typical pdf. As for binders, I printed out the Treasury of the Macabre a while back and added it to a binder. All it takes is a simple 90 degree turn of the binder when I get to that product, and presto! Good to go! I've already purchased The Murmuring Fountain, and it is fantastic. Plan on picking up this and Fiddler's Lament real soon. Yay! Legendary Games is back!!! I know it would be a LOT of extra work but why not landscape for the full color ones since those will likely only be used on computers, tables and the like and do portrait for the print friendly ones. Glad you enjoyed! We'd appreciate reviews from folks who have purchased the new products, so if you've got something to say, shout it out loud! Yep, I'm going to pick this up. This material will work nicely when I Lovecraftify my upcoming Skull and Shackles campaign. When my players start mewling and whining about the nightmares, I'm totally blaming you guys. Just started reading this and I have to say: Nice job! I absolutely love the new Sanity rules. Simple. Quick and easy to use. My rules-lite players will appreciate this. Very nicely done. And reviewed here, on DTRPG and sent to GMS magazine. Lost 2d6 SAN. Awesome work! Can we have more? A lot more? Please? Pretty please? Cheers! Glad you enjoyed, and thanks for the review! They can work with the sanity rules in the GMG, or more particularly with the types of insanity they describe there, but the mechanical bonuses and penalties are somewhat different. The idea was to provide a more streamlined system that made it possible to be insane and yet still able to continue playing your character without becoming totally gimped. Where's the fun in saying "well, you're crazy so now you can't play your character"? How about getting to play your character WHILE you're crazy? Just put up my own review; I love this PDF! If you ever did another one like it I'll be sure to enjoy that one too. Thanks for the review and glad you enjoyed it. As for another product very similar, as a matter of fact I'm working on one right now for our Far East Adventure Path Plug-Ins. It takes a somewhat different tack, exploring the mysteries of ki rather than sanity and insanity, though there are some dark places to explore there as well. Hopefully I should have it done in time for a September release, but that would mean stopping goofing off on the Paizo boards and getting back to writing! Review incoming but I have to say excellent job guys, my GM already wants to incorporate this into our game. That being said on the shards of Sarkulis I have to ask is the language requirement meant to call back to Skald or the kellid language of Hallit? If it's supposed to be Skald I have to ask how would you describe the Hallit language in setting neutral terms? Edit: also is the dream serpent spell supposed to be a mythos spell? Hey quick few questions on mythos spells and tomes. 1. Are Mythos tomes meant to be treated like artifacts with them being only destroyable through specific methods or are they like any other book and can just be burned up if the party feels up for it? 2. To use a mythos ritual does it need to be with the original book or can it be with any book which has copied the spell, i.e. if my alchemist copies blightcore meltdown from Omni Mutadis into his formula book can he use the ritual now so long as he has his alchemy book or does he still need Omni Mutadis?